Need to Know is the type of book that pulls you into its intricate plot very quickly to the point that you are dragged kicking from chapter to chapter as you witness Vivian falling deeper into a conspiracy. The unique thing that I found about this book was the fact that Vivian discovers that her husband, Matt, is actually a deep cover Russian agent very early on in the book. It is at this point that Vivian is put in the impossible position of either doing the right thing and telling the authorities what she has found out or trying to eliminate the evidence linking him back to the Russian spy cell. The rest of the book is split between the past and the present. While reading the bits set in the past, you can’t help but question Matt’s motives all through their relationship. It just seemed that every suggestion or choice Vivian makes or doesn’t make under the guidance is all for some sort of endgame. It made it so very difficult to believe that the things that Matt is suggesting and recommending in the present is also for the good of Vivian and their family. This doubt just keeps growing and even at its conclusion I am still very much on the fence. The book is told completely from Vivians point of view, so there were many times that I found myself getting very frustrated at the actions she took. I did understand why she felt that taking this course of action was to help keep her family together. There did seem quite a bit of emotional manipulation of Vivian, not only by Matt by some of the other players in this complex game of chess. What I did find myself doing was question what would have happened had the roles been reversed? What would Matt do if he found out that Vivian was a Russian sleeper agent? Would he have taken the same choices that Vivian did? I could not help but make the comparisons. The end of the book took a very unexpected turn and made me re-evaluate the full book. I sat there for ages in shock because I had no idea that this is where it would end up. Yet, the clues were all right in front of my face. 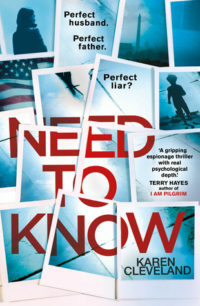 Need to Know is tightly written and highly tense thriller. Like Vivian, you are drawn further and further into this very complex plot. It is difficult to know who to trust and suspicion falls on everyone. If you start reading this book, be sure that you have plenty of coffee at the ready because you will want to find out what happens next.